Landsat-derived bathymetry compared with a nautical chart. Image credit: IHO-IOC GEBCO Cook Book. Feb 11, 2014 • One year ago today, Landsat 8 blasted off from California’s Vandenberg Air Force Base and arched over the shimmering Pacific on its way into orbit. Landsat 8’s main sensor, the Operational Land Imager (OLI), is the latest model in the long line of Landsat Earth-looking radiometers—sensors that have been measuring visible and infrared light reflected from our planet since 1972. The purpose of Landsat (as the name implies) is to observe Earth’s landmasses. Over the past four decades, Landsat has amassed a long record of natural and manmade change not only to Earth’s land, but also to the planet’s coastal waters. Soon after the first Landsat’s launch, researchers realized that the satellite’s data could be used to make bathymetric measurements. In the mid-1970s, NASA worked closely with famed oceanographer Jacques Cousteau and demonstrated that, with clear water conditions and ancillary information about seafloor reflectivity, water depths as great as 22 meters (~72 feet) could be measured. Since then, Landsat-derived bathymetry has often been used for coastal seafloor change reconnaissance. In between intensive (and expensive) hydrographic sonar surveys, water depth changes resulting from storms, sedimentation, or large-scale engineering projects can be estimated with Landsat. 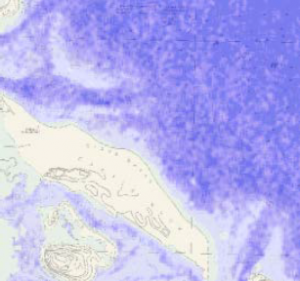 The International Hydrographic Organization and the United Nations’ Intergovernmental Oceanographic Commission jointly create an authoritative, publicly available, global bathymetry map known as the General Bathymetric Chart of the Oceans, or GEBCO. Their companion how-to guide for creating bathymetric charts includes a chapter on using Landsat to derive bathymetry. Studies are underway to determine if the new sensor features of Landsat 8 will further improve Landsat-derived bathymetry. To date, GEBCO-affiliated oceanographers have found that Landsat 8’s new cirrus cloud detection band helps correct for measurement distortions introduced by the atmosphere. While a study presented at the Fall 2013 American Geophysical Union meeting showed that Landsat 8’s higher radiometric resolution (i.e., its 12-bit data) and its new “true-blue” band (0.435–0.452 µm) increase Landsat 8’s bathymetric accuracy at depths over 10 meters as compared to its predecessor (namely, Landsats 5 and 7). Landsat 8 collected over 160,000 images during its first year in orbit. As it acquires more data, advantages that its new technology offers for bathymetry will be better defined. Fabian C. Polcyn, “NASA/Cousteau Ocean Bathymetry Experiment: Remote Bathymetry Using High Gain Landsat Data,” (Ann Arbor, MI: Environmental Research Institute of Michigan, 1976, NASA CR- ERIM 118500-1-F). James C. Hammack, “Landsat Goes to Sea,” Photogrammetric Engineering & Remote Sensing 43, no. 6 (June 1977): 683–691. Shachak Pe’eri, Brian Madore, Lee Alexander, Christopher E. Parrish, Andrew A. Armstrong, and Chukwuma Azuike (2013), “Landsat 8 Satellite-Derived Bathymetry,” The IHO-IOC GEBCO Cook Book, Edition 2.25.13, International Hydrographic Office (IHO)/ International Ocean Commission (IOC), Monaco. David Hulslander, “A Quantitative Comparison of Traditional and Image-Derived Bathymetry From Landsats 5, 7, and 8.” Abstract EP13A-0836, presented at 2013 Fall Meeting, AGU, San Francisco, Calif., 9–13 Dec. 2013.